TERRIFIC ACCESS AND DESIRABLE LOCATION MAKING FOR A PRIME PROPERTY FOR POTENTIAL INVESTMENT! 153 Acres (+)(-) Located just east of HWY 289 and less than a mile south of FM HWY 902 in the edge of Dorchester with city water available. The property has a tremendous amount of road frontage on 3 sides with frontages on Mackey and Old Preston RDS making for a prospective residential development, commercial property development due to the railroad access, or a buy and hold investment. No floodplain. Agricultural tax exemption. Not zoned. 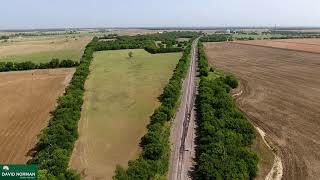 Currently, the property is being farmed for row crops, and a cattle operation. A very nice clean property that has a good drive-up appeal. See document supplements for aerials and location maps. Excludes:	Farm crops currently growing on the property. Minerals.